A winter stroll through the woods after the leavs have fallien shows how many native evergreen shrubs and trees contribute to their beauty. 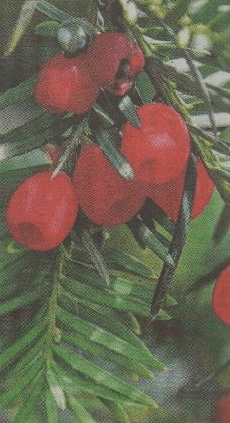 Tough butcher’s broom firms small, impenetrable thickets, often around the base of a tree. 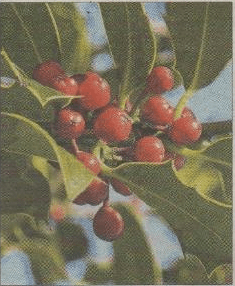 With its needle-sharp prickly leaves, it is easy to see why it was on called knee-holly or knee-holm. It is an unlikely-looking member of the lily family. Each leaf is a flattened stem and usually bears a tiny pale green six-petalled flower in the centre in January, perhaps alongside a bright red berry from the previous year. The little thickets offer sanctuary to wood mice and other small creatures threatened by foxes. Butchers once tied bunches of the branches together to form a harsh broom to clean their work surfaces. But today individual branches are often sprayed with gold or silver to be used as Christmas decorations. Yews form quite large stands to some chalky woods and appear to be spreading quite rapidly in the present climate to judge by the number of small young trees I have seen in recent years. They flourish in the shade when small and willowy, but little or nothing grows beneath them when large. Their beautiful red berries contain a very poisonous seed. Holly stands out with its glossy dark green leaves. 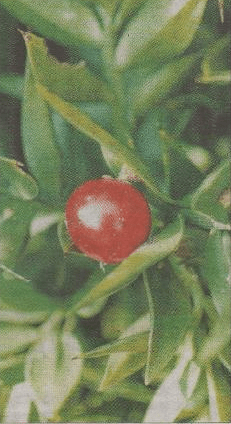 Only females bear the bright red berries we associate with Christmas and which birds quickly devour in a cold snap. It is usually seen at its best as a freestanding tree, in a hedge, on the edge of a wood or, uniquely in Kent, on the vast shingle expanses of the MOD’s Lydd Ranges where it is known as the holmstone and is carefully protected. In chalky woodlands, another beautiful plant comes into Its own in winter – evergreen daphne laureola or spurge laurel, perhaps more common in Kent than elsewhere in Britain. Usually around 90cm (3ft) tall, it produces clusters of pale green, sweet-smelling flowers before the trees are in leaf. Ivy is often ignored or regarded as a garden post when it clambers up walls and trees, but it is an important plant, a refuge for many small creatures, a nesting place for birds, a rich source of nectar for bees and butterflies, and its black berries are sought after by blackbirds in the winter months. It’s worth giving it space in the garden if you want to see the full beauty of nature, especially in the autumn. Now it is leaf-sweeping time and I make my usual plea to leave a few piles of leaves undisturbed in the corner of the garden, against a house or shed or in the bottom of a hedge. A winter refuge is vital to help small creatures such as frogs and toads survive the rain and cold. They will repay us by eating slugs and snails in the spring. Compost heaps are a great help too – not the expensive modern barrel types beloved by some garden centres, but a good old-fashioned pile of garden and vegetable waste and grass cuttings. Grass snakes and slow worms may find a home there, and mammals too, as a Barham reader discovered when he found a dormouse peacefully hibernating. Hedgehogs like a dry corner in which to hibernate, perhaps a pile of logs, a hollow beneath a hedge or even under a garden shed or summerhouse where they can create a nest and line It with dry leaves. Sadly, hedgehog numbers continue to decline. Are they being eaten by badgers or falling victim to slug bait? The jury is still out. 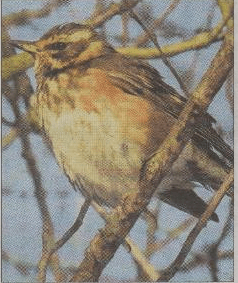 While the last of our summer visiting birds were leaving in November, two northern thrushes arrived, redwings and fieldfares. They prefer our mild winters to their northern breeding grounds. Here they feed on a variety of insects, seeds and berries, particularly hawthorn. Jays are becoming more adventurous in search of food at this time of the year. Always cautions and often offering no more than a fleeting sight in summer, they are now flying down from trees to search for acorns they may have buried In the garden earlier in the autumn.